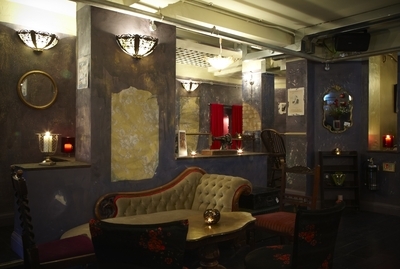 A very new small cocktail drinkers' underground drinking den of paradise, hidden away in a basement of Fitzrovia London. Look out for the pretty fairy lights wound round the building's bannister to lead you into the funky cocktail bar below. This place only opened 3 months ago but is already proving very popular. Lucky Pig's decor is fashionable in a London chic style with worn and torn-looking walls, old-school posters, art deco lampshades and vintage mix-and-match furniture. 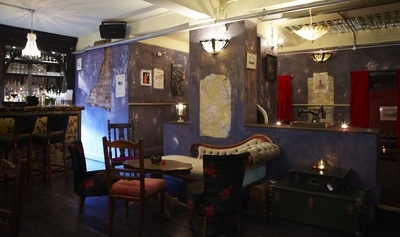 There are cute arched alcoves to hide away in, perhaps making it a great first date bar. 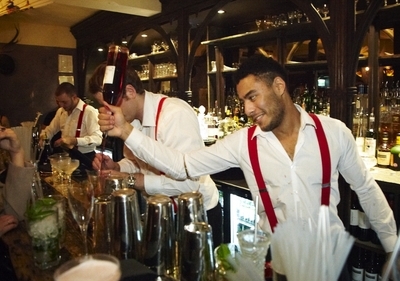 The cocktails in here are just wonderful, served by braces-clad barmen. They have a vast menu that can be viewed on their website but my favourite has to be the La Femme en Rose, a champagne cocktail with orange, lemon and pineapple, just delicious. 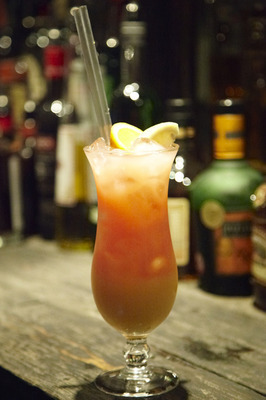 This place is very casual but sipping one of these, you definitely feel like you want to be wearing that LBD and heels. On the cocktail menu there is also a page dedicated to 'experimental' cocktails. Check out the Granny Smash, vodka grape juice, orange and mint. A treat in a glass. If you are looking for a late night but extremely unpretentious drinking bar for after work drinks with colleagues, a date or weekend drinks with friends, then this is the place. It fits all occasions and is also perfect to kick back and listen to some easy going live music. Lucky Pig is the kind of bar you always hope you'll stumble upon by accident but rarely do. Once you've stepped inside - it's very hard to leave.